I learned about this ban when Edward Thomas, a PhD candidate at Queen’s, presented his research on the topic to the Queen’s Senate and informed us that the motion that had set the ban in place had never been officially repealed. He asked us to formally rescind the motion, which we did during the October meeting of the Senate. According to Mr. Thomas, this ban was put in place in order to be in line with the discriminatory policies favoured at the time by the American Medical Association (AMA), the organization that ranked medical schools in North America. While the AMA had no control over the policies of Canadian medical schools, the Carnegie Foundation and the Rockefeller Foundation consulted its rankings when they made decisions about whether or not to provide funding to medical schools. It seems, then, that the leaders of the Queen’s School of Medicine decided to ban Black students in order to receive a higher ranking from the AMA and thus receive more funding. 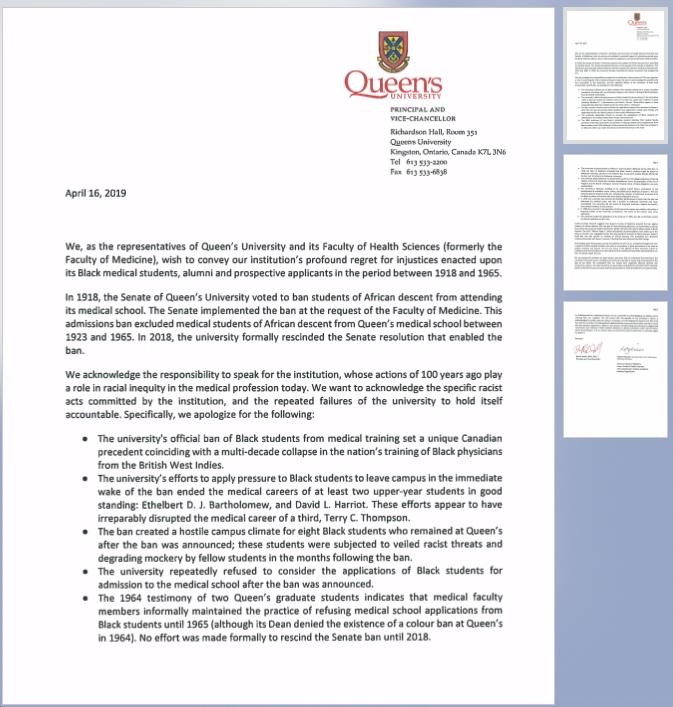 As a result of this ban, at least two Black students at Queen’s had their medical careers ended. Eight Black students resisted the policy and remained at the university, but they were subjected to racism and mockery from their peers. After putting the ban in place, Queen’s repeatedly refused to consider the applications of Black students until 1965. From the beginning, university leadership was not forthright about their reasons for putting the ban in place. In 1918, university leaders said that the school needed to ban Black students because veterans of the First World War who had returned to Kingston refused to be seen by them. The Black students themselves, however, claimed that they were not aware of any instances of such refusal. It seems, then, that the university administration gave this explanation in order to disguise the more likely reason that the ban was being instated as part of their efforts to receive funding from the Carnegie and Rockefeller Foundations. Moreover, at the time, the School of Medicine claimed that Queen’s would make arrangements that would enable current Black students to transfer easily to other schools of medicine, such as Dalhousie. But there is no evidence that such arrangements were ever made. This lack of transparency continued in later years, as university leadership misrepresented the ban or failed to hold Queen’s accountable for its actions. In 1978, for instance, the family of Ethelbert Bartholomew – an upper-year student whose medical career was suddenly ended by the policy in 1918 – asked the university why Ethelbert had been expelled from Queen’s in his fourth year, when he was in good standing. In response, university leadership simply reiterated the suggestion that Ethelbert’s expulsion would have been due to the prejudices of Kingston veterans, and they did not take the opportunity to apologize for the harm that the ban had done to Ethelbert. University leaders also misrepresented the history of the ban on at least three other occasions in 1964, 1986, and 1988. In these instances, Queen’s leaders would make false claims that the ban had ended earlier than it had or that all students originally affected by it had successfully transferred elsewhere. It would be hard to put into words how taken aback I was to learn about this history. This policy was so undeniably unjust, and I knew that formally rescinding the motion had to be only the beginning of the process of making amends for this wrong. Knowing that we needed to do more, I formed a commission of faculty, students, and staff from Queen’s in order to discuss what concrete steps we can take to address this historical injustice. As a first step, Principal Daniel Woolf and I will be publicly apologizing for the policy tomorrow – Tuesday, April 16th – at this month’s meeting of the Queen’s Senate. A recording of the apology is now available. If you have any accessibility concerns for watching the video, please email our communications team (fhscomms@queensu.ca) for assistance. I am also pleased to say that Daniel Bartholomew, the son of Ethelbert Bartholomew, will be travelling to Kingston to be present at this public apology. Going forward, the commission has also agreed to take a range of actions to address our past discrimination and promote diversity at our institution. We will send personal letters of apology to family members of the individuals who were affected by the ban. We will provide greater focus on inclusivity and diversity in our curriculum. We have initiated an admission award for Black medical students that will be implemented for the incoming class. We will create an exhibit addressing the ban that will be displayed in the atrium of the new medical building. In 2020, we will host a symposium that will focus on the history of the ban and the future of diversity in the medical profession. And we will implement a mentorship program for Black students in the School of Medicine. As an institution, we can never undo the harm that we caused to generations of Black students, and we have to accept that our actions contributed to the inequities in the medical profession that still exist today. I hope, though, that the steps we are taking now will move the School of Medicine in the direction of greater inclusivity, diversity and equity. This is a moment of reckoning for Queen’s, but it is also an opportunity to affirm our dedication to the principles of equality in the School of Medicine. If you have any thoughts on how we can best take action to address this wrong from our past or help strengthen our commitment to equity in the present, please share them in the comments below. Or better yet, please stop by the Macklem House: my door is always open. Thank you for your thoughtful commentary on this racist policy. Has Queens investigated its other faculties or the university as a whole for evidence of historical racism or even present day racism? Thank you for your comment, Jim, and for your question. Recently, Queen's has been very active in examining racism, diversity, and inclusion on campus. The Principal even created a committee to explore these issues. You can read more about that committee and the progress that has been made in working toward its recommendations here: https://www.queensu.ca/inclusive/initiatives/picrdi. All of us at Queen's take this work very seriously and are committed to making Queen's more diverse, inclusive, and equitable for everyone. Lack of diversity was obvious when I began Med School at Queen's in 1976; it never occurred to me that it would have been formalized in the way Mr. Thomas uncovered. Besides the fact that less than 1/3 of our classmates were women, we had no classmates who appeared to be of non-European ancestry. I was a Queen's undergrad; classmates of non-European ancestry who were at least as well qualified as me were admitted to other Med Schools, not Queen's. They were not surprised; I did not know what to say at the time. Thank you for addressing this, so that we might learn from the past and do better in the future. Thank you for your comment, John, and for sharing your story on the blog. As you say, my sincere hope is that by addressing this troubling history we can learn from our failures and make Queen's a more diverse, inclusive, and equitable place in the future. Allen Fletcher, Queens Meds '69; Faculty, Queens Health Sciences, Dept. of Pathology, !974- 2002. The only words that come to mind, having read your blog, are a very heartfelt THANK YOU!!! Thank you for your comment and encouragement, Allen. I appreciate your support. I am profoundly disappointed to learn of this dismal chapter in the history of Queen's. Did the leadership of Queen's not learn anything from Robert Sutherland's story and example. (https://charlatan.ca/2016/02/when-canadas-first-black-university-grad-s…). "Those that forget history..."
Thank you for attempting to correct this shameful wrong-doing. Thank you for sharing your thoughts, Tom. This history is indeed a sad episode in Queen's past. It is too bad that Queen's did not learn from Robert Sutherland's example. But perhaps it is fitting that today's apology took place in Robert Sutherland Hall, which is named after him. I was always proud that Queen’s graduated women physicians in the 1800s but am appalled that we (as an historical body of Queen’s health sciences alums) were responsible for racial discrimination. Thank you for the sensitivity and proactive response, which I hope will continue. Thank you for your thoughts and your encouragement, Kate. We will absolutely continue to be proactive. Yesterday's apology was important, but it is only the first of many steps.